1. From the Effects window (Video Effects > Pixelan folder) of Premiere Pro, drag and drop FilmTouch (or FilmTouch Pro if you have that) onto a clip. It will then appear in the Effect Controls panel of Premiere Pro. 2. In the Effect Controls panel, all FilmTouch controls are available directly in the panel (see image at right). OR (in FilmTouch Pro only) you can click the Open Pixelan UI button to access the Pixelan custom interface (as shown below). Both interfaces are similar, but the Effect Controls panel offers native keyframing of controls and is most convenient for quick tweaking of film looks. The Pixelan custom interface shows detailed help more visibly. 3. 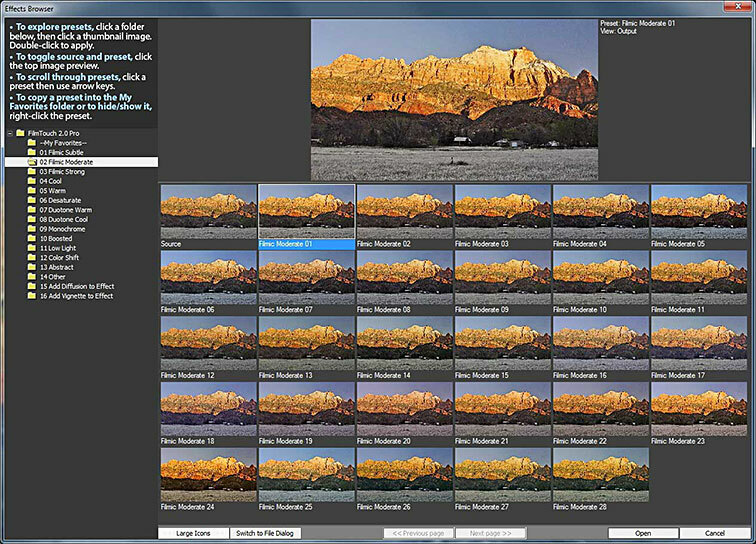 Click the blue Click here to load a preset... button at the top of FilmTouch to open a large Effects Browser window to visually choose/compare FilmTouch presets. 1. Make sure you first turn on Premiere Element's Expert view to see all available effects and transitions, including plug-ins. 2. From the Effects tab at the bottom of Premiere Elements, choose Pixelan in the tab's top menu. Then drag-and-drop FilmTouch (or FilmTouch Pro if you have that) onto a clip. 3. In the Applied Effects panel of Premiere Elements, all FilmTouch controls are available (as shown at right) if you click to untwirl the controls. In FilmTouch Pro only, click the Open Pixelan UI button in the Presets section to access the Pixelan custom interface (as shown below). Both interfaces are similar, but the Effect Controls panel is most convenient for quick tweaking of film looks. The Pixelan custom interface shows detailed help and has a handy Recent button to quickly re-choose recently used presets. 1. From the Effects tab at the bottom of Premiere Elements, choose Pixelan in the tab's top menu. Then drag-and-drop FilmTouch (or FilmTouch Pro if you have that) onto a clip. 2. 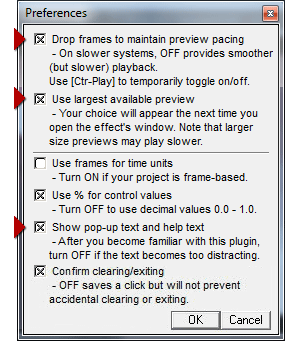 In the Applied Effects panel of Premiere Elements, all FilmTouch controls are available (as shown at right) EXCEPT the top Presets section buttons (due to plug-in limitations of Premiere Elements -- see NOTE below). In FilmTouch Pro only, you can Alt-click the Setup button at right of the FilmTouch Pro name to access the Pixelan custom interface (as shown below). Both interfaces are similar, but the Effect Controls panel offers native keyframing of controls and is most convenient for quick tweaking of film looks. The Pixelan custom interface shows detailed help more visibly and has a handy Recent button to quickly re-choose recently used presets. 3. Click the Setup button at right of the FilmTouch name to open a large Effects Browser window to visually choose/compare FilmTouch presets. -- Open Pixelan UI (in FT Pro only) or About info: Alt-click the Setup button. 1. From the Edit panel (Effects Section) of Premiere Elements 10, scroll down to the Pixelan listing and drag-and-drop FilmTouch (or FilmTouch Pro if you have that) onto a clip. 2. Click the small Edit Effects button at the bottom of the Edit panel. In the Effects Properties view, all FilmTouch controls are available (as shown above) EXCEPT the top Presets section buttons (due to plug-in limitations of Premiere Elements -- see NOTE above). In FilmTouch Pro only, you can Alt-click the Setup button at right of the FilmTouch Pro name to access the Pixelan custom interface (as shown below). Both interfaces are similar, but the Effect Properties panel offers native keyframing of controls and is most convenient for quick tweaking of film looks. The Pixelan custom interface shows detailed help more visibly and has a handy Recent button to quickly re-choose recently used presets. FilmTouch 2.0 has two types of presets -- Effects Browser presets and Section presets (Pro version only). Premiere Pro additionally can create Animation presets in its Effects Control panel. Prefer to use the Pixelan custom interface instead of Premiere's interface? Instead of the above, use these shortcuts to load presets faster: To see recently chosen Effects Browser presets, click the Recent button. For a drop-down menu of Effects Browser presets, right-click the Click here to load a preset... button. To use a standard Open file dialog box, Alt-click the Click here to load a preset... button. • To toggle between viewing the source file image and the FilmTouch preset, click the top large preview image in the Effects Browser. Unlike the Effect Browser presets, these change ONLY the controls in ONE section of FilmTouch Pro. Mixing presets from several sections is a quick and easy way to try hundreds of fresh film look effects and variations. In Premiere Pro's interface, within any section (aka "twirly") of controls, choose Section Presets. (In the Pixelan custom interface, click the blue FX folder icon at the top right side of any section.) 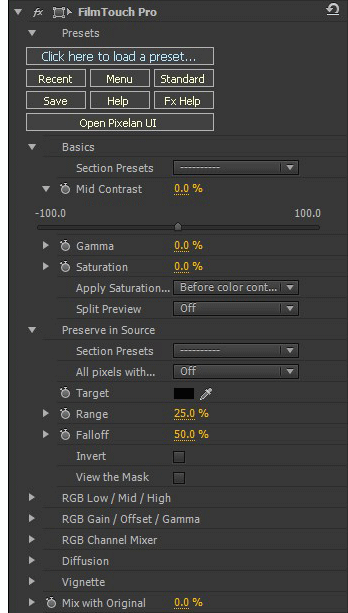 To choose a section preset visually instead of from a list, in Premiere Pro's interface click the submenu to activate it, then use your mouse's scroll wheel. In the Pixelan custom interface, simply move your mouse through the choices. In Premiere Pro, you can also create an Animation Preset by right-clicking the FilmTouch name, then choosing Save Preset... to save a re-usable effect you can drag-and-drop from the Presets section of the Effect Controls panel of Premiere Pro. Note: FilmTouch 2.0 'regular' version has Mid Contrast, Gamma, and Mix with Original controls only -- the three most useful ways to tweak existing film look presets. IMPORTANT: As noted in the above section, to quickly try common settings in any section of FilmTouch 2.0 Pro, use the Section Presets menu at any section's top. To vary a control over time, in the Premiere Pro interface use Premiere's standard keyframing controls. Adjust midtone contrast, brightness, or saturation -- the most common overall ways to fine-tune a film look. Mid Contrast. Positive values increase the contrast in midtone areas. Negative values decrease. Gamma. Positive values increase the proportion of brighter areas to darker areas. Negative values decrease. Saturation. Positive values increase the intensity of colors. Negative values decrease. Apply Saturation... Sets when the above saturation adjustment applies. After... is handy to easily saturate or desaturate the look no matter what other color adjustments occur below. Split Preview. Easily compare the effect to your source clip’s original look. IMPORTANT: Be sure to turn this off before rendering to not include the split in your video. Optionally leave untouched (from Basics and RGB section adjustments) an already “just right” color or luminance within your scene. All pixels with... To define the Target area where the source clip's look will be preserved, select from Target’s color, Target’s luminance only, Target’s hue only, or Target’s hue & saturation only. Target. In the preview, click the eyedropper on the color area to keep it unchanged. Or use the color swatch to choose a color or luminance. For example, to preserve the white in a source clip’s clouds, click the Target eyedropper in the cloud and select Target’s luminance only. To preserve skin tones, click in the skin and choose Target’s color. Range. Positive values preserve additional hue/luminance areas that are similar to the Target. Negative values reduce the range. Falloff. Positive values increase the feathering around preserved colors. Negative values decrease. Invert. Switch preserved and adjustable image areas. Handy when clicking an adjustable color is easier than clicking a color to preserve. View the Mask. Turn on to clearly see the preserved region’s mask. Fine-tune a film look by adjusting shadows, midtones, or highlights per color channel. Easily tint only shadows towards a desired color, for example. Low R/G/B. Fine-tune shadows by brightening or darkening the red/green/blue channel. Mid R/G/B. Fine-tune midtones by brightening or darkening the red/green/blue channel. High R/G/B. Fine-tune highlights by brightening or darkening the red/green/blue channel. Pin Black/White. On protects pure black or white areas from adjustments in this section. Fine-tune the film look by adjusting the strength and brightness of a color channel. Gain R/G/B. Fine-tune highlights by adjusting the red/green/blue channel’s gain. Offset R/G/B. Fine-tune all image areas by adjusting the red/green/blue channel’s offset. Gamma R/G/B. Fine-tune midtones by adjusting the red/green/blue channel’s gamma. Optionally add realistic light diffusion to a film look. Blur. Sets the blur strength. Blend Mode. To fine-tune the blur, choose a Photoshop-like blend mode. Blend Opacity. Set the opacity of the blend mode above. 100% is pure blending, 200% is pure blur. For unusual looks, enter values outside the 0-200% range. Dark/Light Bias. Increase to shift the diffusion into darker areas. Range. Increase to spread the diffusion effect. 100% is uniform diffusion over the entire scene. Glow. Optionally add a glow to enhance the diffusion realism. Glow Color. In the preview, click the eyedropper to choose a glow color from your scene. Or use the color swatch to choose a glow color. Optionally add a realistic lens vignette to a film look. Strength. Set how strongly the vignette conforms to the current shape. Shape. Choose a shape from several options. Inverted choices brighten instead of darken the vignette. Softness. Set the shape's edge softness. Size. Set the shape's size. Center. Position the shape within the image by dragging the center point. If Linear is selected, you can adjust its angle by moving the center point. For more precision, enter numerical values, such as to match the shape in two different film looks. Style. Choose the vignette’s style, from standard to unique looks. Standard is a 'real world' lens vignette. Standard 2 is similar but treat colors in the vignette area differently. Color only vignettes only color adjustments (the RGB sections). Diffusion only vignettes only the diffusion section. Color and Diffusion vignettes just the Basics and RGB sections. Mix with Original. To alter the film look effect’s overall strength, adjust its transparency with the source image. Positive values increase the source’s strength. Negative values can create unusual looks -- experiment! If you also have a high-resolution monitor and are editing with HD or larger footage, consider turning ON Use largest available preview which will use the largest preview size in FilmTouch that can fit in your monitor while still leaving sufficient room for FilmTouch's controls. Note that your choice for this setting will appear the next time you open FilmTouch's window. After you become more familiar with FilmTouch 2.0, consider turning off Show pop-up text and help text. That will leave more vertical space for the section controls and also reduce any distraction from the ever-changing help text.